But we've forged ahead and started our addition unit. Our first addition strategy was "Plus Zero". Our second one is "Count Up". Since my class has a wide range of abilities (as most classes do) I like worksheets that accommodate everyone. 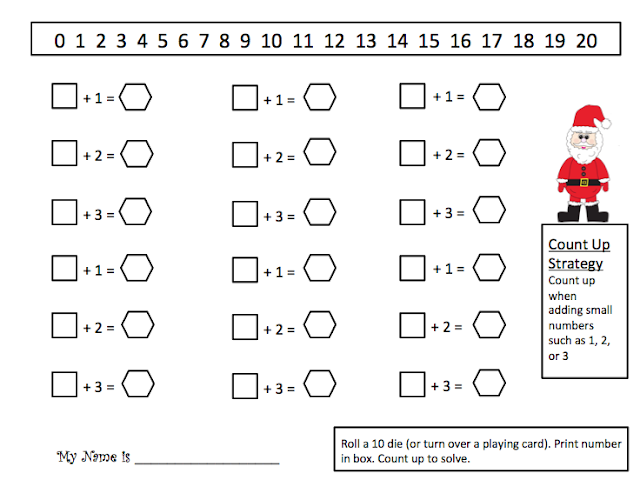 This is a good one because it can be as easy as rolling one die to determine the first addend OR it can be as challenging as rolling two or three dice (adding those) and then counting up. Click the image if you'd like to grab the sheet. BTW, if you like the little Santa graphic, I made him a few nights ago. You can grab your own HERE. As you know, I like to teach the kids a poem a week. 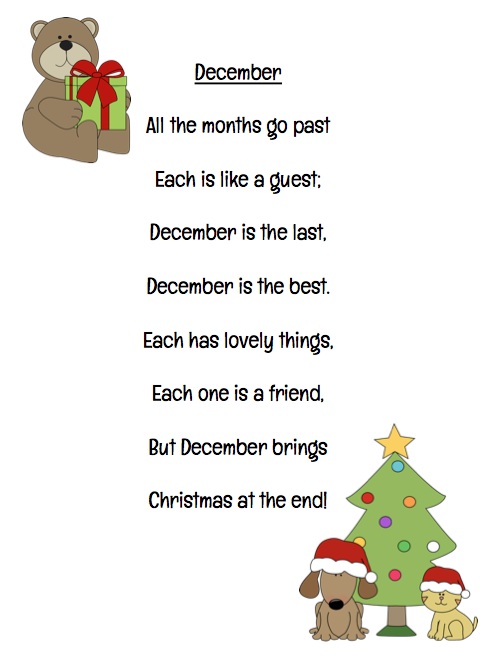 Here's this week's poem. If you click the image you can grab a coloured and black/white version. I love that math game!!! Thanks for sharing. Nothing like a little snow to get the kids bouncing off the walls! The math game is great! I love ones that work for all levels! I am enjoying a lazy day due to ice, sleet and snow yesterday. It was almost impossible to keep my kids on track yesterday with the snow, cupcakes for a birthday and children getting picked up early. I've been struggling with fitting math in too. We live parallel lives. :) Am printing this now!